I was never sure if I loved Jazlan Rahmat or not but after his interview with Shahanaaz Habib (Rebel with a cause, The Star, 9 Nov 2014) I have to admit that the son of Tok Mat has guts and is smart, if a bit bitter and sometimes foolhardy (well, in the past at least). His critical views about the ageing Umno, his wish for changes that he knows he can't effectively bring about, his open (blind?) loyalty to a party that "don't like me, anyway". "They see me as someone who doesn't want to preserve the old ways". Kinda reminds me of Shahrir Samad, the original Eighties rebel in Umno. Many felt that if Shahrir had not turned against Mahathir Mohamad during the party crisis in 1987, Malaysia would have a different Prime Minister today. But if you think Jazlan is no longer as ambitious politically now as he used to be (when he decided to go for the party's No 2 post, "which killed my political career", for example), hold your horses. Jazlan knows how to play the game, don't you forget that. And so just three days after telling us that he'd gone as far as he could and was now "just another brick in the wall", the 48-year old MP says he is coming down like tons of bricks on 13 Ministries in his capacity as PAC chairman. Who else in Umno who's not in Cabinet has gotten such powers? He's also got the PAC to come up with something on KLIA2 "although it is outside our scope". The issue with KLIA2 is of public interest and concerns safety, he contends. "Sometimes things get clouded by the amount people receive". "I support the Sedition Act. It is a deterrent and should be used to educate and prevent people from behaving in a way that disturbs the harmony of the country. "But now people see it as being a “weapon” to silence people. That’s why it is important to use the Sedition Act to nip all things in the bud irrespective of whether it is against Islam, Christianity or the Hindus. The authorities should be fair to all. When the government side starts using the act as a “weapon”, it is wrong. We must have clear guidelines on what is seditious because the existing guidelines are too general. "The government spent decades to neutralise fiery student leaders of the 1970s and you don’t see the next echelon anymore. But the minute you catch people like Azmi Sharom and use the Sedition Act against him, he will become the role model to university kids. And this will create a new generation who will rise up." Nurjazlan epitomed the fuedalistic nature of our Malay society. He inherited his late father constituency, Pulai. Yet he complained in his interview that he got to wait for 20 years rank and file before being nominated as BN MP. If we were to take him seriously, he should not be in the seat warmed by his father for 30 years bro. He is the example of what he is complaining at great length in his interview. Dunia politik memang ajaib bro. Being a Johorean, I can't help but to compare him with Tok Mat. Tok Mat is representative of a very loyal Malay who dare not touch the hornet's nest but his son's foray into a few touchy issues here and there could serve him well in the future. He is unlike Saifudin Abdullah of Temerloh but could be almost be like Shahrir one day. Another Johorean guy is Tunku Putra, who is unlike his father,Hamid Jumat, the quintessential Tengku Abd Rahman loyalist. He had raised a few issues that has been the bane of many Johor Malays presently. beautiful comments. I am an UMNO member , and I like this guy. Reliable sources told me he is more Chinese than a Malay. He may be Tok Mat son bit he is more of his Chinese mom's son. Not a shred of a Malay psyche in him to be liked by Umno. Umno is, after all, a Malay preservation party, make no mistake about this. Just like alleged "Khir Joahari"son but raise by his chauvinist Chinese mother Christine, no shred of a Malayness in this DAP guy, a name may be a Malay sounding, but a Malay they are not. Make no mistake. What he says has justifications. Nevertheless, he himself emulates and practices everything negative that he points out. If only he practices what he says! if he knows the game, then why should he go for the post, of which he allegedly told people the reason of his political career being 'killed'. a smart, brave, and wise politician would have not being 'killed' further more if the subject is the son of a prominent UMNO legend. so yes it is okay to have ambition, but this child is not TokMat. comparing him with TokMat is unfair to the legend status of his father. you know which one is THE brick? that guy from sabah. rahman dahalan. INHERITED the Pulai constituency he did..
Kenapa dia senyap jer pasal 1MDB sedangkan people's money is a at stake? mana lagi penting isu program 1Azam kelolaan Kementerian Pembangunan Wanita atau hutang 1MDB yang berbilion ringgit? Ahhh, Jazlan ... where do I start? My "reliable sources" also told me that he loves to eat the famous nasi ambang at Bandar Baru UDA. So there must be an inkling of Jawaness in his blood. Rahman Dahlan is not only a good minister and a politician but he has good officers in his office. One of them is Tengku Azman. Thank you Bro Rocky for having raised such a good story about my sdra Nur Jazlan....once forgotten up and coming young political with creditability and guts to throw mud at others whom he thinks deserves to be criticised and punished. I have known Jazlan when he was still a baby and have seen him grew from the yesterday years until what he is today. 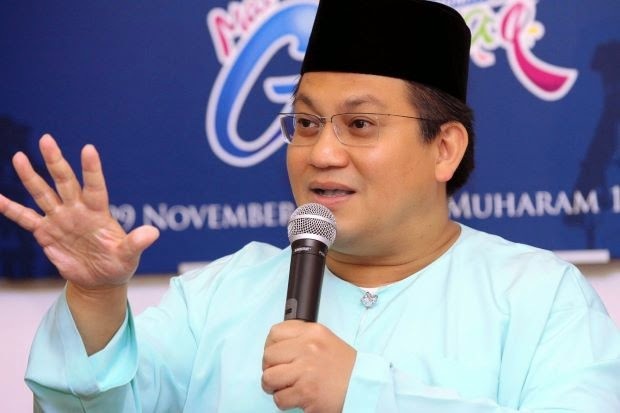 Nur Jazlan's success does not depend on his late father..Tok Mat and he was not actually suitable for UMNO politics compared to his second brother Jazman. We use to tease and provoke him a lot and I can proud say that he has made it to the UMNO front after more than 20 years of his political career and ambition. He is a fighter and today as Chairman of PAC, he is serious in his job and well respected not only by UMNO/BN but also by the opposition members. Yes, he had revolted against the UMNO leadership with reasons and logic and had prepared to be one of enemy of the lesser majority of UMNO members. As an UMNO veteran myself I could see Jazlan's frustration in many ways. He is now doing his best to criticise UMNO with constructive criticism and I believe those who care and love UMNO's future need to be more focused and not power crazy or based on personal vengeance against all our young and promising UMNO leaders. UMNO needs to transform itself fast and fully support Najib's bold transformation programs in order to rescue the party from going down the drain even before the next GE.